PROS: Basic phone with big buttons, big easy to read numbers on display, and amplified sound. If you get a GoPlan with this phone, it activates a 5-star medic alert button to use in an emergency. You can also get access to an app for caregivers and family that can show if the phone is charged and turned on, as well as providing a locator service and notification if the emergency button has been pushed. CONS: If you are buying the basic service plan the number of minutes of talk time isn’t very much for the price you are playing. These days it is difficult to find a basic cell phone that is super easy to use and has a loud, clear volume. 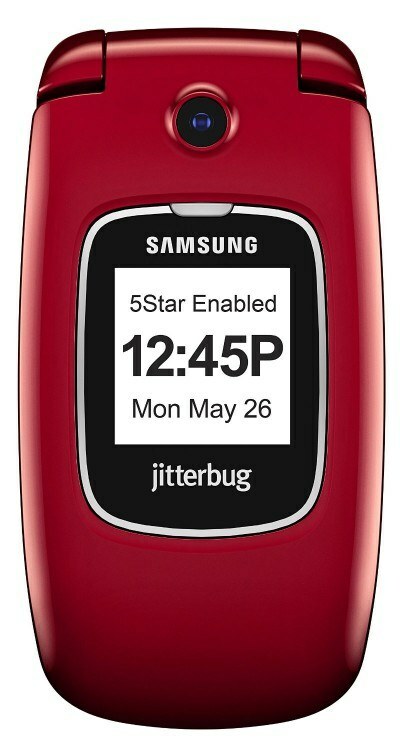 Jitterbug 5 is an excellent option if that is the type of phone you are looking for. It is designed for the elderly who may not be comfortable using a smartphone, but want a cell phone to keep in touch with family and friends. This phone gives users the option to use it as a medic alert device with 24-hour access to health and safety experts. Depending on the plan you select, you can get other features like a daily “wellness” call to check in to see if you’re ok, automated call reminders to take meds and it let your family or caregivers know if you’ve missed taking a medication, or didn’t respond to your wellness check-in call. 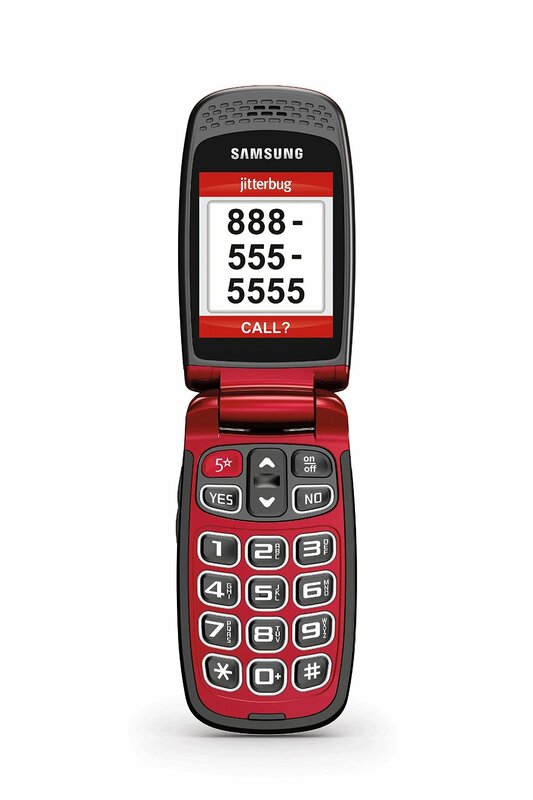 This phone is designed for a specific audience of seniors who want a basic phone with an easy medic alert option. But it also provides some other great features for the elderly such as the option to increase the amplification level so the sound that you are hearing can go up or down to suit your own needs. It is also hearing-aid compatible (M4/T4 rating), and it has a powerful speaker, so the volume is nice and loud whether held to your ear or use the built-in speaker. The ringtone can also be set quite loud, and there are multiple ringtones to choose from. It is a basic flip phone style. It comes in red, blue or white. The display is a bright color screen, and the numbers are huge to make it easy to read. It also has a backlit keypad which is helpful if you are in low light areas. The 5Star button is probably the best feature on this phone (if you choose that service plan). All the user has to do is press the 5star button, and they are connected immediately to a service that will help in an emergency or even just with medical questions. What a lot of users like about this emergency option is that it isn’t dependant on a landline, which a lot of the emergency pendants are. You can use this cellphone where you are out, and if you get into trouble, all you need to do is press the 5Star button. Another of the big selling features is this cell is that it has one of the longest lasting batteries on the market. It can go to around 25 days without needing to be charged. So it is great if you only the phone occasionally or for emergencies. There is also a camera, which you can get to through the menu, and it is possible to send photos to people on in your contacts list. 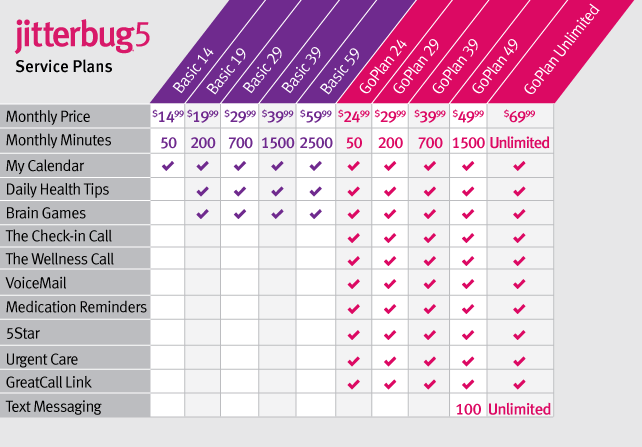 There are different levels to this service plan; the one big drawback is that the plan must be purchased through Great Call, this phone can’t be used on other carriers. The cheapest service plan you can get is $14.99 a month, but it doesn’t offer much only 50 minutes talk time as well call waiting, caller ID, free roaming, and free long distance. You don’t get any of the GoPlan emergency features that make this phone so useful. If you just want it as a regular phone, you can probably get something cheaper elsewhere. If you bump up to the GreatCall GoPlan for $24.99 a month, you get the 50 minutes talk time as well as the activation of the 5Star button, instant access to a health professional, as well as other health-related features and voice mail. Click here to see a chart of the service plans and their fees. All plans are contract-free, without cancellation fees, although there is a $35 activation fee. 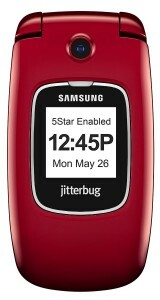 The Jitterbug5 is an excellent phone for a particular market. It would be perfect for anyone who wants a cell phone that is easy to use and has a good clear sound level, so it works well for users who may have difficulty hearing when speaking on the phone. It is also suitable for the elderly who would like access to doctors or nurses and emergency services at the push of a button. It can also be a handy cell phone for a family who is living away from the person who is carrying the phone to help monitor their health and wellbeing.